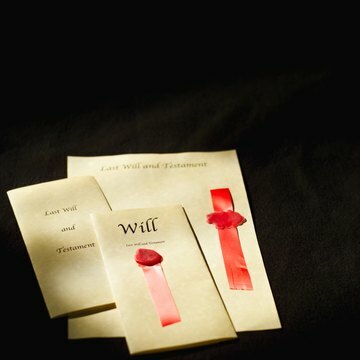 The testator, or person drafting the will, appoints an executor to handle the distribution of the estate. If the will does not name an executor, the court appoints an administrator. Many people consider the role of executor to be an honorary appointment. However, an executor incurs serious responsibilities in administering the affairs for the estate. While the final decision rests with the testator, following certain guidelines can minimize misunderstandings and may prevent serious legal difficulties down the line. If possible, appoint an executor who has financial and legal expertise, as well as a good working knowledge of estate taxes, Bankrate.com advises. The duties of an executor range beyond distributing the assets of the estate. The executor must also settle the financial obligations of the estate including filing final individual federal and state income tax returns. However, if the estate is small and the distribution of assets is evenly divided, the task is much less complex, MSN Money states. A testator may appoint one or more co-executors to handle the estate. For instance, a bank or trust company may serve as a co-executor along with a family member or friend to lend financial expertise. A testator may also appoint a qualified executor whose duties are limited to a specific circumstance, for instance, handling the sale of a particular real estate property. The testator may also name a co-executor to take over the task if the primary executor dies or refuses to accept the appointment. Inform the executor of the decision to appoint him to the role and provide a clear understanding to the executor of what the task entails. Do not expect an executor to accept an appointment without having seen the will, the American Bar Association states. Schedule an appointment with an attorney to go through the will and explain any sections that are unclear or which may present potential problems, Bankrate.com advises. This should be done while the testator is still alive so that she may name another executor if necessary. Many wills explicitly allow the executor to hire an attorney to help with the administration of the estate. A clause limiting the liability of the executor to gross negligence is also common. Consider potential red flags that may complicate the job of an executor, such as vastly unequal distribution of assets, missing heirs or certain beneficiaries being disinherited. Other red flags are a will drawn up using software rather than by an attorney, or a disorganized testator. Dealing with a complex estate, a poorly drafted will or serious conflict within a family may overwhelm a lay person appointed as an executor, according to MSN Money. Does the Executor of an Estate Have Control of a Body?